Measure for Measure may have been written around 1603, but Shakespeare seems to have cobbled together his plot from a day of watching CNN—including the parts that make us laugh. 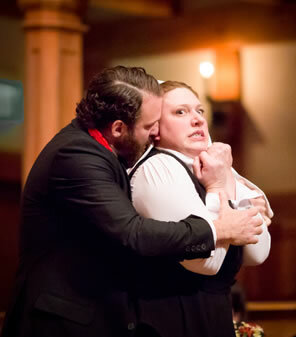 Angelo (Jonathan Holtzman) assaults Isabella (Allison Glenzer) in the Amrican Shakespeare Center production of William Shakespeare's Measure for Measure. Photo by Lindsey Walters, American Shakespeare Center. Ten years ago, in a talk-back session after a presentation of Aaron Posner's inspired and inspiring puppet-supplemented production of William Shakespeare's Measure for Measure at the Folger Theatre, questions and comments from the audience centered on the play's archaic plot. For example, how did actress Karen Peakes find the heart of her character Isabella, who is unwilling to give up her virginity to save her brother's life? Can someone in 2006 really be such a prude? Isn't executing a man for getting his fiancée pregnant a stretch even for Shakespeare's 16th century? And that bed trick—really? Me, I asked the actor playing Pompey, David Marks, what it was like getting into a fight with a puppet playing the part of Barnardine. a politician thinking his own moral misdeeds will never come to light when they already have. Measure for Measure may have been written around 1603, but Shakespeare seems to have cobbled together his plot from a day of watching CNN—including the parts that make us laugh. As for the bed trick, such a prank will work as long as men continue relying on their other brain for many of their decisions. 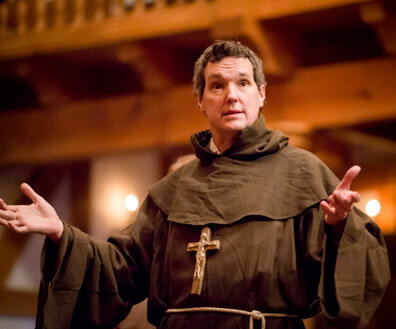 Measure for Measure's modern relevance is manifested in the American Shakespeare Center's current Actors' Renaissance Season production at the Blackfriars Playhouse in Staunton, Virginia. One scene in particular stands out—Jonathan Holtzman as Angelo propositioning Isabella, played by Allison Glenzer—but the whole is engagingly presented and expertly acted by this 12-member company mounting the play per the standards of the Actors' Renaissance Season: a week of rehearsal time, no director, no costume designer (they dress themselves in a mid-20th century Americana look, evoking a period when, in our national memory, things were presented as black and white in a society that followed established norms). This production method is intended to experience the plays in the manner Shakespeare's own company would have staged them. How much this process directly informs the overall vision of these productions is neither consistent nor certain. The actors will tell you they simply don't have the time to hone or argue their ideas; thus, much of what we see is spontaneous and reacting to the text, a testimony to both the actors' intelligence and their trust in each other (it's no accident that this season's company comprises only Blackfriars Playhouse veterans). With Shakespeare's The Tempest, the first play staged this season, the production has a collective quality to it, despite its strong individual performances. With Measure for Measure, while the cast does tight ensemble work, the play is performed more from individual perspectives, and that enlightens the remarkable psychological and sociological depth Shakespeare wrote into the play's 18 named characters. Performances that stand out include Chris Johnston as the lothario Lucio, who serves as this play's archetypal braggart. Though a purely comic role and one who represents the licentious side of Viennese life, Lucio also is an instrument of good, prompting Isabella to appeal to Angelo on behalf of her death-sentenced brother (Lucio's friend). Johnston never leaves the realm of comedy in his portrayal, even flirting with Isabella when he meets her though she's a novice in a convent. In the final scene, Lucio's interruptions are a great running joke, and Johnston nails each and every one of them with exact timing and perfect tone. 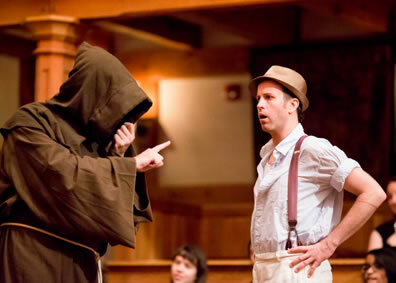 Lucio (Chris Johnston, right) accosts the disguised Duke of Vienna (John Harrell) in the final scene of William Shakespeare's Measure for Measure at the American Shakespeare Center's Blackfriars Playhouse. Below, Harrell as the Duke disguised as a friar trying to manage a means of justice for Isabella. Photos by Lindsey Walters, American Shakespeare Center. Patrick Midgely plays the bawd Pompey, and though this character serves as the archetypal Shakespeare clown (compositionally he's a descendant of Falstaff), Midgley plays the part with urbane sophistication. Watching Midgley's Pompey justifying prostitution is like watching Larry Flynt in all his smarmy charm advocating for Hustler magazine as a champion of First Amendment rights—you may be appalled on moral grounds, but you can't deny the logic. Actors working the Blackfriars are encouraged to interact directly with the audience (replicating Shakespeare's staging conditions, the audience sits in close proximity to the stage—on the stage, even—and the houselights remain on throughout the performance), and nobody works a crowd better than Midgley does. That quality reverberates with centurieslong resonance when Pompey notes that many of the prison's residents were customers at Mistress Overdone's house, where he served as tapster (and bawd). Pompey then goes on to name certain individuals and Midgley refers to individuals in the audience for each one (I was "young Dizzy" and my wife was "young Master Deepvow," so he only exaggerated my age). Given that Shakespeare's Globe Theater was situated in the environs of London's red light district, the original Pompey may have done the same thing, but with more embarrassing connotations for the individuals he would point out. Best evidence of the production's foundation in individual perspectives is in the play's dramatic turning point, Act II, Scene 4, when Angelo, ruling Vienna in the absence of the Duke (John Harrell), propositions Isabella. Her brother, Claudio (Benjamin Reed) has been sentenced to die for getting his betrothed Juliet (Lauren Ballard) extremely pregnant. Claudio has urged Lucio to enlist Isabella to advocate for him before Angelo, and over the course of their first meeting Angelo becomes smitten with Isabella and requests she come again the next day to further press her case. Between these visits Angelo reveals in soliloquy his sudden passion for Isabella and the internal conflict this causes him: his morality is true—so are his natural sexual longings, which he eventually dresses in religious wool. Holtzman has not tried to interpret Angelo beyond what's given in the text. We see an earnest governor (when the Duke first taps him as surrogate, Holtzman's Angelo appears carrying law books he's obviously been studying) intent on carrying out Vienna's laws (the Duke anticipates this). Holtzman displays a rich intellect in Angelo, even in the rare gems of humor he occasionally dispenses. Glenzer plays Isabella as young—probably not yet 20—not so much naïve as preferring a simple life of holy sisterhood in order to avoid the lasciviousness and imbroglios of Vienna society. When she first approaches Angelo, she is shy and ever conscious of her social place in the company of this great man; but, prompted by Lucio, she finds her intellectual foothold and grows bolder in her argument, relying on spiritual logic to counter his legal logic. We also see clear divergence of thought in a single gesture. "Go to your bosom; knock there, and ask your heart what it doth know that's like my brother's fault," she says, placing her hand on his breast and then on her own. It's a purely innocent gesture on her priestess-like part; to him it's "such sense that my sense breeds with it." In their second meeting, it's notable that Angelo immediately tells Isabella that Claudio must die, and Isabella immediately accepts the verdict. This brief passage re-establishes their social positions. Then he starts riddling with her. She at first doesn't get the punchline, but as she begins understanding his real intentions, she tries to talk around the point as she nervously assesses her vulnerability. Holtzman and Glenzer, coming at this moment from their characters' individual perspectives, turn this into a breath-stopping scene. Even as he lays bare his proposition, Angelo still cloaks it in righteousness. His is such a heartfelt belief that I have empathy for him though I do not condone his thoughts, let alone his actions; my wife has no empathy, seeing Angelo as a man using his righteousness as a weapon. And how does Isabella see him? In Glenzer's playing, Isabella is more focused on avoiding inevitable attack. As Angelo makes clear his meaning, Glenzer's voice rises and she begins physically trembling. Holtzman's Angelo strokes and pets her innocently, but she doesn't see it that way. Then, in a fervor of righteous passion, he embraces Isabella with a kiss; Glenzer's Isabella bites Angelo's tongue. The audience lets out a collective gasp. The game changes now: Angelo becomes a tyrant as he tends to his bleeding tongue; Isabella is condemned to silent victimhood. "To whom should I complain?" she tearfully asks the audience: "Did I tell this, who would believe me?" Angelo has a revealing soliloquy later when he ruminates on how he has wronged Isabella, but assures himself that she dare not expose him: "For my authority bears off a credent bulk that no particular scandal once can touch but it confounds the breather." Chutzpah, you might think. Holtzman, though, is pursuing self-assurance but stumbles over the second of his dastardly deeds. "He should have lived," he suddenly cries referring to Claudio. However, he carefully reconstructs good reason for Claudio's execution—landing on the notion that death saves Claudio from living a dishonored life—but yet he can't shake his personal and legal overreach. "Would yet he had lived. Alack, when once our grace we have forgot, nothing goes right; we would and we would not." Isabella has a couple more crux moments to navigate. One is when, in the prison, she relates to Claudio what Angelo has proposed. He decries the hypocritical Angelo and insists that Isabella not give in to him. But as he thinks more about the consequences of her defiance as it concerns him—"Death is a fearful thing," he says—he begins appealing his own case to her. Reed comes at these lines from Claudio's own sense of righteousness. "The weariest and most loathèd worldly life that age, ache, penury, and imprisonment can lay on nature is a paradise to what we fear of death," he says. He's begging for mercy from his sister the same way she begged it of Angelo on Claudio's behalf. "Sweet sister, let me live. What sin you do to save a brother's life, Nature dispenses with the deed so far that it becomes a virtue." It's a line echoing Angelo's proposition to Isabella, though Claudio's not aware of that. And if you've been focusing on Reed's earnest supplication rather than Glenzer's growing consternation, Isabella's eruption of "O, you beast!" will knock your soul around just as it does Reed's now hapless Claudio. Isabella's third crux moment comes when, in the grand finale, the Duke is carrying out his charade of justice (charade: a game in which the Duke gets across his deeper purpose through symbolic gestures). Claudio is reportedly dead. With Angelo's crime revealed, the Duke forces him to marry his original betrothed, Mariana, and then sentences him to execution. Mariana implores Isabella to advocate for Angelo on her behalf, and the Duke counters, "Against all sense you do importune her." In Glenzer's expression, he's right. A lot is going on in this scene, but eventually all eyes turn to Glenzer as her Isabella ponders all consequences: for the sake of Mariana, for the sake of her own vengeful pride, and for Angelo—perhaps for her brother, too. Glenzer's next move slices through the theater's thick silence as she steps forward, kneels, and bows her head. "Most bounteous sir, look, if it please you, on this man condemned as if my brother lived." I never knew the power of that line before, the depth in its multiple meanings toward the Duke, toward Angelo, toward her brother. The rest of the speech is somewhat equivocal. "I partly think a due sincerity governed [Angelo's] deeds till he did look on me," she says, and, "For Angelo, his act did not o'ertake his bad intent, and must be buried but as an intent that perished by the way. Thoughts are no subjects, intents but merely thoughts." Glenzer's Isabella is doing the religiously right thing here: her heart doesn't seem entirely at peace with it, however. And the Duke's further actions suggest he suspects that. Ah yes, there is a fourth crux Isabella must face: the Duke's out-of-nowhere, twice-spoken marriage proposal to her. The play ends without her speaking an answer. Glenzer only turns to the audience with yet another look of consternation, reminding us why she wanted to live a cloistered life in the first place (this is the fourth man in this play who places a premium on her sexuality). It's left to us to provide our own answer for her. My answer, at least with this production, is to run like hell. The Duke is a real conundrum of a character, one of the most difficult to pin down in the entire Shakespeare canon. In reviews of other productions I've written extensively on the various depictions I've seen, from dangerous despot to rom-com hero, from master manipulator to bumbling slacker. Harrell, a smart Shakespearean and a wonderful actor, gives us no answers. The Duke opens the play with some of the most obtuse verses Shakespeare ever wrote (even scholars can't decipher them, some suggesting that lines have been mistakenly cut), and Harrell apparently takes this to heart as integral to the Duke's personality. He is an obtuse fellow, and I noticed throughout the play how often his soliloquies in particular seemed to go over my head. I would credit this to my tired, wine-infused brain, except I understood all the other characters clearly (including the equivocating Pompey), and Harrell is among the best actors I've seen at mastering Shakespeare's verse with expert clarity. No, I think Harrell is deliberately being obtuse, presenting a Duke who is living in his own peculiar reality that doesn't jibe with anybody else's. He's scripting his own way through the play, and in the final scene, in fact, he and the Provost speak their lines as if playing from a script (Chad Bradford's Provost can barely contain his knowledge of what's coming). Harrell's Duke is obviously having fun setting Angelo up. Then, when the Duke unhoods Claudio before Isabella, Harrell puts his arms around Reed and with self-centered glee says "If he be like your brother, for his sake is he pardoned; and for your lovely sake give me your hand, and say you will be mine. He is my brother, too." He anticipates this to be a triumphant moment, but it disturbs both Isabella and Claudio into motionless silence while the audience laughs at the Duke's obvious misstep. "But, a fitter time for that," Harrell's Duke continues nervously but quickly recovering. It's his "Oops" moment, and he puts it behind him without considering consequences, his or anybody else's. Such is Measure for Measure: equal measures of laughs and tragic tension in a society of individual perspectives. If the play is to be considered archaic, then these be archaic times we live in.